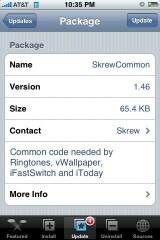 The update to version 1.46 of SkrewCommon affects quite a few application in the Skrew source. The update to Skrew Common fixes iToday so that if you have not entered a location into a Calendar event, it will not display the @ sign (see screenshot below). It adds an autolock feature into vWallpaper that allows your iPhone to autolock when you have a video wallpaper. The autolock feature seemed to work fine for me. Doug has been waiting for this feature in vWallpaper for a long time! And finally, the update to SkrewCommon attempts to fix the issue with the reboot feature in iFastSwitch. The update to iFastSwitch also adds an SSH option. You can get all these applications and SkrewCommon via the Skrew source. • Don’t display “@” if there are not location defined. • Problem for halt / reboot : please test if it’s ok for you now. maximum details about your configuration. Intelliscreen is 10x better than itoday. Still unable to Respring, Restart, Shutdown. Thought it Resprung once but I cant really be sure because it took a bit of time. The WiFi, Airplane, wont turn GREEN (Airport not a biggie) as well as SSH. Even though in BossPref if says WiFi, SSH are on and installed.